We hear that some of the homeless people who have been camping out under the viaducts have already been housed as part of the city's new Housing-First initiative. In his latest email newsletter, Ald. Cappleman talks about the process, the progress, and what we can do to help these people make a successful transition into permanent housing. We understand that local Channels 5 and 7 are doing stories about the movement from the dangerous viaducts to permanent housing, so keep an eye out if you watch the TV news! "How You Can Help. I have worked hard to encourage the City of Chicago to adopt a housing first model to reduce the number of people living with homelessness after noticing its success in other parts of the country. This strategy works best when two components are in place: a sufficient amount of subsidized housing coupled with wrap-around services. The most difficult piece to this model is having a dedicated source of funding to make an investment for long-term cost savings. I’m working with Mayor Emanuel to have a steady stream of funds available so that we can remain focused on housing. Some of this funding will be through a 4% surcharge for a new Airbnb Ordinance and there will be some additional funding coming from the Clarendon-Montrose TIF development. Our pilot program to get 70 people living under the viaducts along Lake Shore Drive directly into housing is now underway. We have had a number of meetings with housing advocates, the folks living under the viaducts, city departments, and other community leaders to create a plan that will work. After all of these individuals without homes are in their new apartments, the Dept. of Family & Support Services (DFSS) will assess what worked well with this project and where improvements can be made. Afterwards, DFSS will select more areas throughout the city where people are living outside in encampments to implement this housing-first strategy. How You Can Help. I’ve asked Inspiration Corporation to help me with a “New Home Starter Kit” drive. This starter kit will provide these 70 individuals going into new apartments with some of the needed supplies to start life in their new homes. To organize this process of purchasing this starter kit, my office has created a registry with Target. If you’re able to help, please click here to go to the registry and purchase needed items that will assist these individuals start their new life in an apartment. Inspiration Corporation will host a day at their Uptown headquarters where you will be invited to help put these starter kits together so that they can be distributed. A substantial number of people living on the streets have told me that they became homeless right after they were released from Cook County Jail with no employment or disability in place and no family available to help them start over again. Without these necessary supports in place, it’s no wonder why we have such a high recidivism rate in our prisons. Later this month, I will be meeting with Cook County Sheriff Dart’s Office, DFSS, and the Dept. of Public Health to discuss how a more effective transition could be made when people are released from jail. I am pleased that so much is coming together to help those in need. It's a very complex process, but lasting solutions require thoughtful planning with everyone working together." I hope these reporter got the full story including the "advocates" who use the homeless as political pawns and who plan to repopulate the viaducts with more tents as soon as these are removed. I'd like to see these people exposed for what they do and the harm they do to these people keeping them living in squalor. let em move in with you then. I've noticed during my bike ride to work this morning.. that the homeless are now setting up camp in the park itself. 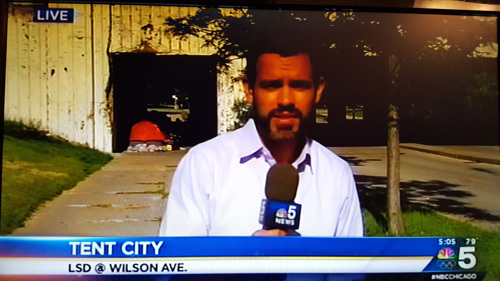 I think the activist groups and their members, who violated multiple city ordinances and zoning laws in creating a tent town on a public sidewalk should be assessed fines and pay all the costs associated with tent town. Why should the taxpayers foot the bill for their illegal and irresponsible means of protest? Today, I drove through the Wilson and Lawrence underpasses on my way to the dog beach. They were cleaning tent town. Public resources devoted to this all-morning project included: 1 homeless services staffer and van, one Park District security officer and SUV, two city street sweepers and 2 streets and san staffers, two police beat cars and three beat officers, a tact car and SUV and several tact officers. (I'm sure our local police officers had nothing better to do, like solve the three shooting cases that occurred a few blocks away in Sheridan Park this weekend.) It appeared that one activist was there to oversee and complain. And, don't disregard the risk assumed by the city. The last time a tent city dweller was killed by a car that careened off of the road and ran over a person unwisely drinking and camping a few feet from LSD, the homeless person's family sued and collected a large settlement from the city, ie you my fellow taxpayers. 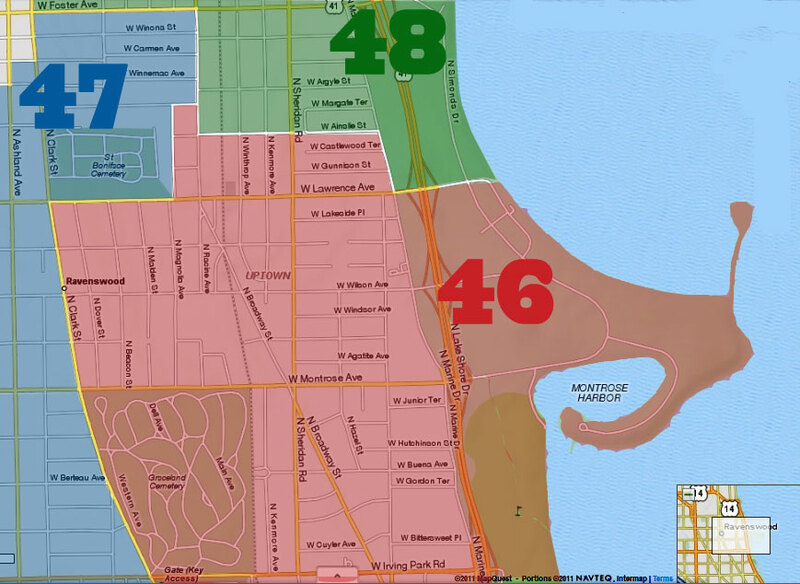 I don't see any reason why 46th Ward TIF money should be diverted from the ward to solve a city-wide and statewide homelessness funding problem, particularly in this situation where an activist group is relocating homeless from other neighborhoods to form a tent city in this one neighborhood. This is a grab for Uptown resources and the alderman should resist it. 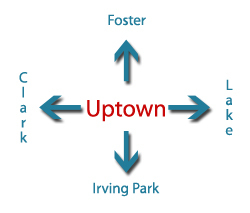 I applaud Capplemann for working on a solution, particularly because he has a social services background, but his solution should be a citywide solution, not one in which Uptown bears the costs for problems being bussed into Uptown, And shame on any media members who attack the generosity of Uptowners and the commitment of Capplemann for insisting that the entire city and entire state pay their due. I've had a few couch surfers in my day. I'm not doing well myself. What have you done, Kenmorekid?